Is corporate worship possible without musical instruments? Is it possible without a praise team? Is it possible without a leader? Of course, worship is possible without any of these, but each in its own right can add a dimension to our worship experience that is not easily duplicated. They can also add a dimension that moves us away from worship. As mentioned before, Judah—the tribe of praise—led the Israelites on their ‘wanderings’ and their marches into battle. It is not “wrong” to have someone leading us as we worship in song. Leading is not simply about getting through the set list. For those of you who may not be aware, your praise team or choir puts in a lot of work long before the Sunday morning gathering. The musicians are practicing individually to hone their craft; but they must also practice with the group of other musicians and singers. All this is time consuming. While you are spending time doing what you enjoy, they are spending time getting ready to help you enjoy the worship-in-song portion of the service. I’m not saying they don’t enjoy that time; but it IS committed time that keeps them from doing something else. Same goes for your preacher, though you expect it of him because there is a salary attached to the job. Assuming the worship leaders are “primed” and ready, there are some things they should pay attention to that will aid the congregation. Since leadership is now done from a position of facing the people, the dynamics have changed. When the choir or team faced the front along with everyone else, all they had to do was follow the music. Here are some tips that you as a leader might want to consider, or you as a follower might want to share. That, of course is a given for any who would want to serve the Lord through the leading of worship. You cannot do that if you arrive with fresh wounds from your battles. Spend time before the Lord in prayer for the service, asking for guidance for the right songs, and praying for those who will attend. If you just had a spousal spat before leaving for the church, either ask the rest of the team to pray for you, or opt out of joining the team for this time. You can only minister what is within you. Yes, Keep your eyes open. Certainly you can close them from time to time, but not for the entire song or set. Some will argue that seeing the people is distracting. That may very well be the case, but you cannot let that stop you. You MUST learn to move beyond the distraction and see the people. With the music as loud as it is today, you will have no idea if the people are with you if your eyes are closed. You won’t know if they are singing. You won’t know if the music has fully engaged them, spirit, soul and body. On the reverse end, leading is about connecting. It is impossible for me to connect with someone who will not open their eyes. Also, it is generally true that when a worship leader has their eyes closed, they also have a pained expression on their face. Their brow is often furrowed and eyes squeezed tightly shut. It is difficult for me to experience joy when I am seeing pain. With your eyes open, it becomes easier to encourage the congregation. Just because you have an awesome voice or killer riffs is no indication the people will follow you. You need to invite them. You can accomplish this in a few different ways scattered throughout the set. 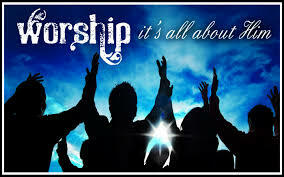 The group leader or someone chosen for the purpose should give the call to worship. Invite the people to stand and join in. Before a particular song it helps to know something about it—why this song? Is there a truth to declare? Is there a verse of Scripture that goes with it? Talking between songs (not every song, though) can help the congregation to keep pace with you and help them to enter into the experience in a more meaningful way. All it takes is a little encouragement. If you are on a worship team, maybe something here could be of use to you. If you know someone on a worship team, maybe there is something from this you should share with them.